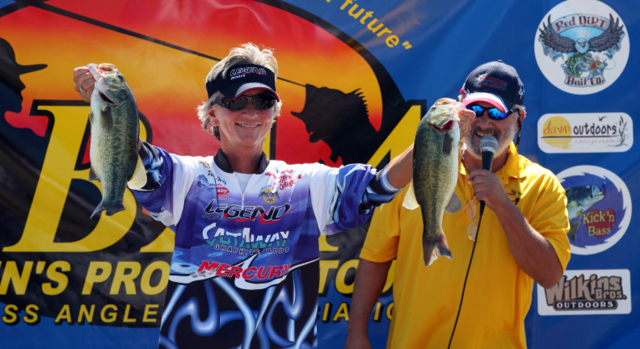 Legendary professional angler Pam Martin-Wells claimed her second straight Lady Bass Anglers Association (LBAA) tournament victory today on Tennessee?s Old Hickory Lake. But equally important Martin-Wells pulled off a come from behind win in the Angler of the Year race to capture the LBAA?s first pro division Angler of the Year (AOY) title. Martin-Wells of Bainbridge, Georgia only brought three bass to the scales today but they weighed a hefty 9.23 pounds and pumped her two-day total at Old Hickory to 17.63 pounds. ?I?ve always said I liked tough tournaments,? she commented, ?for that is when the luck factor is taken out of the equation and I really put my head down and get to it. I pre-fished from daylight until dark and told Steven (husband) this tournament would be similar to Guntersville in that you could not sit in any one place and win it. I tried to stay just like I did at Guntersville ? stay open minded and be versatile.? Martin-Wells calculated that she ran her Legend 69 miles on Old Hickory on day one alone. Finishing behind Martin-Wells in second was Centre, Alabama?s Lisa Johnson who had a two-day total of 15.87 pounds. Rounding out the pro division?s ?Super Seven? at Old Hickory was Plano, Texas?s Cheryl Bowden in third with 15.69; Greenville, Texas? Judith Hart with 15.47 was fourth; Lynda Gessner of Foristell, Missouri was fifth with 13.93, Murchison, Texas resident Pam Ridgle was sixth with 13.54, and Dayton, Tennessee?s Jenny Nevans was seventh with 13.11. Sarah Davis from Livingston, Louisiana led wire-to-wire to capture her first LBAA co-angler crown. Davis brought her second three-fish limit to the scales today to give her a two-day total of 11.51 pounds and the prestigious victory. ?It took a lot of patience,? Davis stated, ?I threw a lot of baits and most of my short fish were on faster moving baits, so most everything was slow (larger worms and Fluke?s). It is awesome to win this! When I first saw these trophies I said I want one of those, and now I have it.? Following Davis in the LBAA?s Old Hickory co-angler ?Super Seven were: Lebanon, Tennessee?s Diana Montgomery in second with 9.95; Bonnie Ward of Snohomish, Washington was third with 8.23; Alpine, Alabama?s Kim Giddens was fourth with 6.81; Martinsburg, West Virginia?s Shannon Wood was fifth with 6.62; and Martha Goodfellow from Simpsonville, South Carolina was seventh with 5.59 pounds. Judith Hart took big bass awards for the Old Hickory event in the pro division with a bass weighing 3.66 pounds, and Jan Bruner captured the award on the co-angler side of things with a bass that weighed in at 4.66 pounds. In the AOY races, Martin-Wells with her victory today at Old Hickory overtook Kim Bain-Moore to claim the LBAA Pro Division AOY title with 1170 points. Martin-Wells and Bain-Moore went into today?s final day of competition tied for the AOY lead. ?This is totally awesome,? stated a very happy Martin-Wells. ?To win this title in the inaugural year of this organization is fantastic. They can never take this away from me ? I was the first! It is neat that I now have won AOY in every woman?s circuit that I have competed in. The Good Lord has definitely shined on me!? The LBAA pro division AOY ?Super Seven? was Bain-Moore in second with 1140 points and Pam Ridgle followed her in third with 1095. Fourth was Lynda Gessner with 1052, and Gessner was followed in fifth by Emily Shaffer with 1029. Sixth and seventh respectively were Jenny Nevans with 988 and Debbie Kemp with 972 points. In the co-angler division, Kim Giddens claimed the 2011 LBAA Co-angler of the Year title with 1150 points. ?It is pretty amazing as this is my first year fishing with these wonderful ladies,? Giddens said. ?When I started into this I felt like I could compete but I never expected to win this.? The LBAA co-angler of the year Super Seven are as follows: Kim Giddens in first with 1150 points and she was followed by Diana Uebelhack with 1085. Third place was claimed by Bonnie Ward with 1067 and fourth was Martha Goodfellow with 1024. Vicki Henderson took fifth place with 1017 points, and Barbara Harris followed her in sixth with 986 points. Donna Newberry nailed down seventh with 969 points. Murchison, Texas resident Pam Ridgle nailed down the 2011 LBAA Rookie of the Year award today as she was the highest finishing pro division rookie in all four regular season LBAA events this year. ?I?m very pleased and ecstatic to maintain and pull off a win like this,? Ridgle stated. ?It was a pretty tough season with all of the mechanical errors I did have, but overall I?m very ecstatic that I did this.? The LBAA today formally announced that their 2011 Lady Bass Classic will be held on Kentucky Lake October 6-8, 2011. The top 21 anglers from both divisions will compete in this prestigious event. The LBAA Old Hickory Homesafe charity tournament will launch at ?safe light? and weigh-in at 3:00 p.m. All launches and weigh-ins will take place at Flipper?s (Bull Creek Ramp). Flipper?s Bait and Tackle is located at 200 Odoms Bend Road, Gallatin, TN. 37066. Phone 1-615-452-7719.